Following on from the immense amount of interest and engagement from the fishing industry and the wider community whilst taking in to account limitations on fishermen’s time and a previously intermittent presence by heritage staff, a new approach to the reporting of finds has been launched. In 2015 the Heritage Lottery Fund (HLF) was approached for funding to support and create the position of Historic Environment Fisheries Liaison Officer (HEFLO). Wessex Archaeology, with the support of the Sussex IFCA, was successful in their application to relaunch the FIPAD, and in February 2016 Alistair Byford-Bates was appointed to the HEFLO post. By becoming a permanent presence on the ground in Sussex the HEFLO will liaise with the fishing community at times that suit the ebb and flow of their daily operations. This will hopefully lead to an improved exchange of information between heritage bodies and the fishermen of Sussex. This in turn should lead to increased reporting of new discoveries via the HEFLO and FIPAD, the collating of information on legacy artefacts, seabed fastener locations, and items recovered and returned to the seabed. In return there will be more successful identification of finds made by fishermen through Wessex Archaeology’s team of finds experts. In carrying out these duties the HEFLO will also provide advice and support on the legal implications of reporting maritime artefacts as required by the Merchant Shipping Act 1995. The HEFLO will also be engaging with the wider to community to raise awareness of our shared maritime heritage and the role the fishing community have played in it. Alistair studied for a degree in Archaeological and Forensic Sciences and a Master’s degree in Applied Sciences by Research at Bournemouth University, after 25 years in the dairy industry. Since then he has been involved with commercial archaeology, working on a range of sites across the UK, and with a disaster management company in Africa and Europe. Many finds discovered offshore and reported through a Protocol will be accessioned into a Museum. As part of the this pilot scheme Wessex Archaeology staff processed finds from Hasting’s Fishermen’s Museum through the Protocol so that information about them enters national heritage databases. 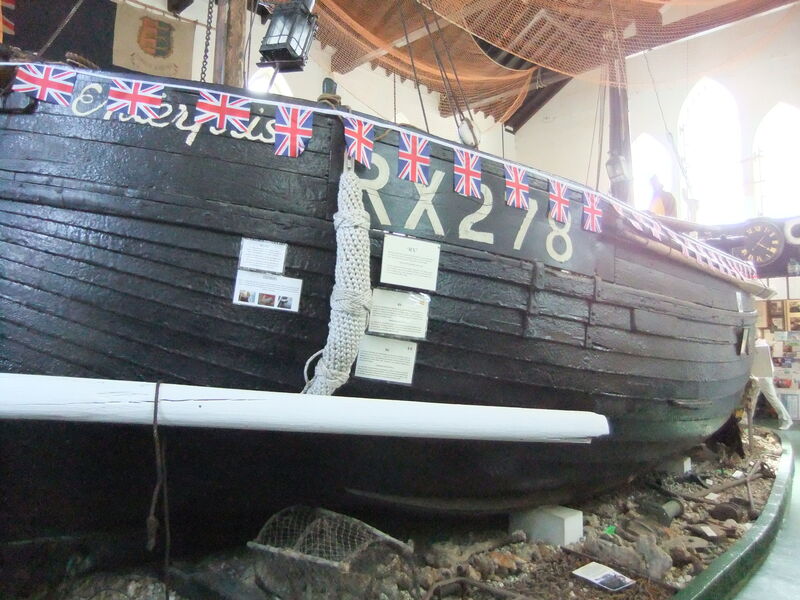 The finds are displayed in the museum around a traditional Sussex vessel – a lugger named the Enterprise. The finds are diverse and include fishing apparatus, ordnance and WWII aircraft parts, parts of vessels, a musket and even a cricket ball which was found in a fishing net in 1997. The Museum is one of the region’s most popular tourist attractions and preserves evidence of the thriving trade that has shaped the development of the Hastings area. This headless and abraded stone statue is interpreted as having an ecclesiastical background. It was found off of Bosham by a fisherman using an oyster dredge and is one of the most evocative finds yet reported through the Protocol. The statue is made of granite – a difficult material in which to pick out fine details though it is clear that the figure is wearing a draped garment similar to a Roman toga. Iain Hewitt of Bournemouth University notes that early post-Roman Christians frequently regarded Roman stylistic elements as being synonymous with Christianity – hence many Christian images depict characters wearing draped ‘toga-like’ garments. The statue itself is not thought to date from the Romano-British period (it is thought to be later) though as yet it is not firmly dated. Stone artefacts are dated based on typological styling and the absence of the head and abrasion of finer details makes firm dating of this find unlikely at this stage. 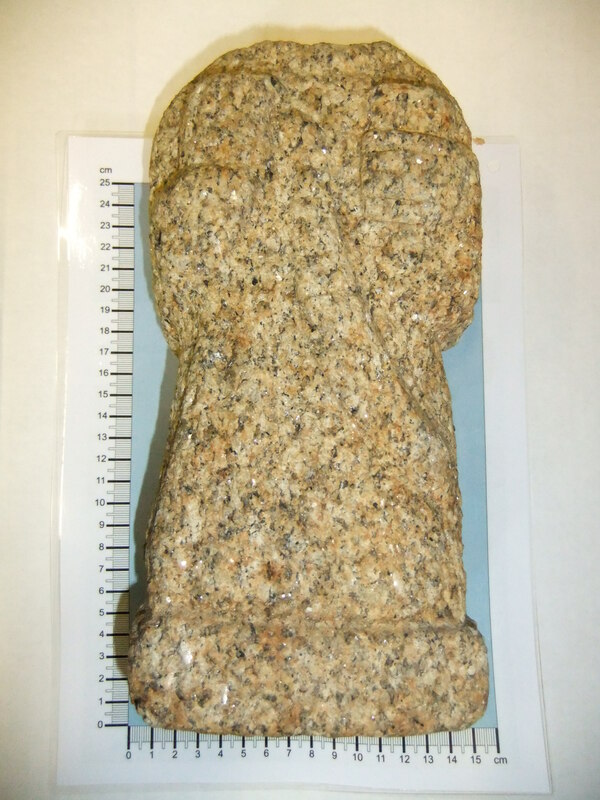 Granite is a robust and hard-wearing material which suggests that this statue was intended for display outside where the fabric of the stone would give it some protection from the elements. 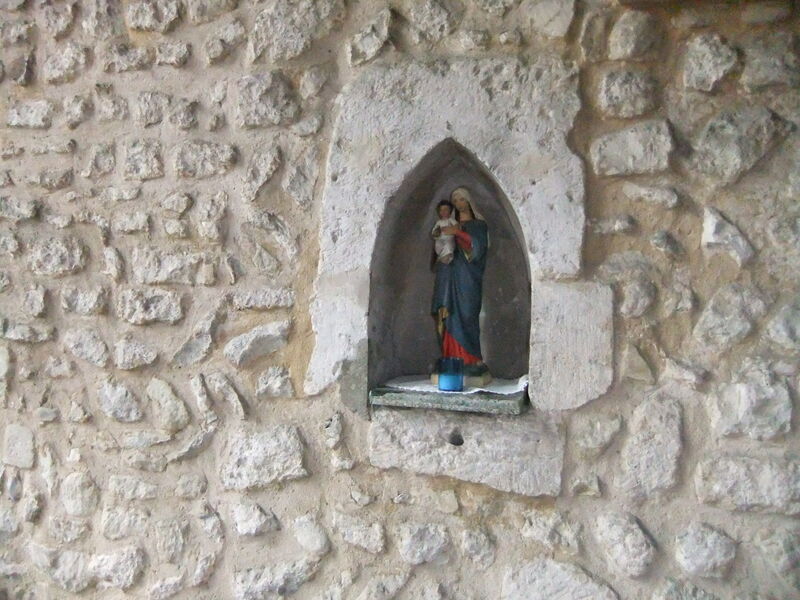 Wessex Archaeology staff noted that Bosham church, close to the area from which it was recovered, has a niche designed to hold a small statuette (and which currently holds a statue of Madonna and child). How the statue came to be offshore is unknown but two likely scenarios have been suggested. Iain puts forward the plausible theory that the statue may have fallen victim to a post-medieval iconoclasm. The second commandment – ‘No graven images or likenesses’ – bans the worship of icons and this figure, which has been decapitated, may have been cast aside under this commandment. Alternatively, the statue may have been damaged and cast into the sea during civil unrest, such as the siege of Chichester during the English Civil War which occurred in December 1642 or the sacking of the city by earlier invaders (depending on the age of the statue). Potential sites on the seabed are often first noted by fishermen. Pots and nets can become snagged on archaeology on the seabed – termed ‘net snags’. Information about such snags is often passed on verbally from vessel to vessel. This potentially means that there is a wealth of archaeological material on the seabed which is well evidenced by fishing vessels but which is not recorded elsewhere. Schemes such as the FIPAD provide a recognised framework through which finds on the seabed can be reported and recorded. During the operation of the FIPAD Pilot Graham Doswell reported a potential site lying off Eastbourne which is believed to hold propellers. Little else is currently known about this site. Information reported through the FIPAD is uploaded onto national databases which act as a point of reference for all archaeological projects, planning consents and offshore developments with regards to heritage. In this instance, this potential site will be reported to the National Record of the Historic Environment maintained by English Heritage (previously the National Monuments Record) and the Historic Environment Record for East Sussex. This discovery will also be reported to the Local Government Archaeology Officer and to the local Finds Liaison Officer. 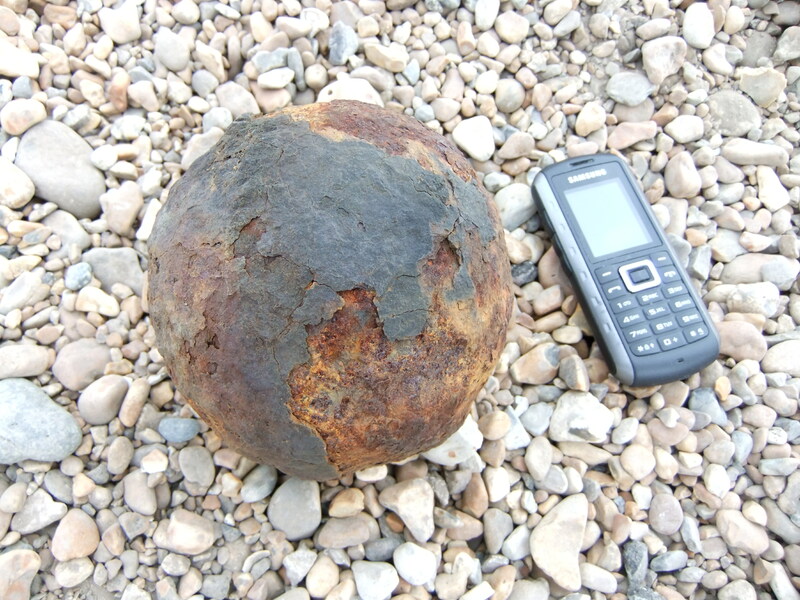 This cannonball was found offshore and appears to be suffering some degradation caused by the damaging effects of submersion and drying on iron finds. Round shot such as these were in use from the medieval period until the 19th century. Early examples were made of stone with iron becoming dominant from the 17th century onwards. This type of ammunition consists simply of a heavy round ball and receives its momentum from gunpowder placed behind it in the barrel of the cannon. They show little variation in construction over time but they do change weight and size reflecting changes in the design of the cannon used to fire them. This example is described as potentially having come from the vicinity of the wreck of the Resolution, which sank in Norman’s Bay during the Great Storm of 1703. Cannonballs are common finds in the south coast region which has played host to an abundance of battles, training shots and shipwrecks during the age of sail accounting for their presence on the seafloor. A concentration of them from one area may indicate the site of a naval battle, or (and especially if maritime material is recovered alongside them) the site of a shipwreck. This find was reported through the Protocol and is retained in personal possession. This wooden timber was discovered offshore. When it was discovered in the 1980’s it was around 15 feet in length. The finder, Graham Doswell, contacted an archaeologist who cleaned the find and reduced it to its current length. 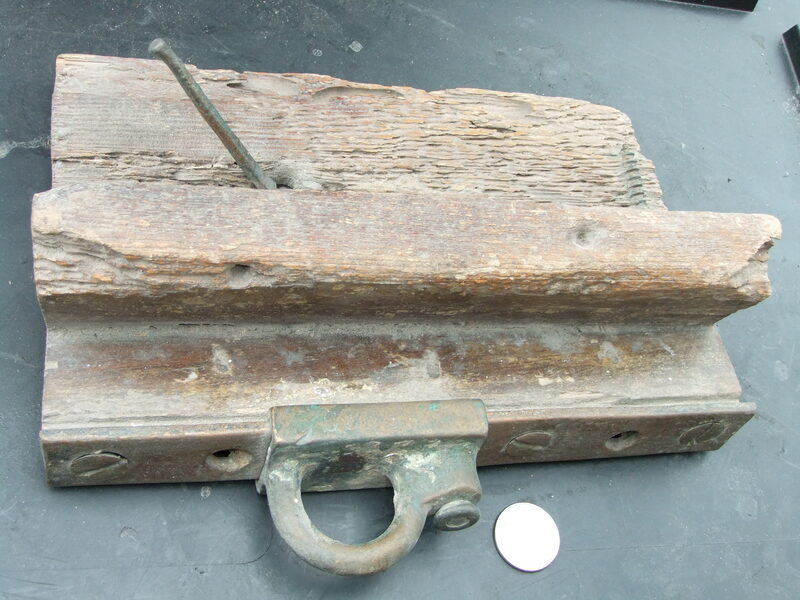 Images of the find were shown to Wessex Archaeology’s Coastal and Marine Team who agreed that the find may be part of the gunwale of a vessel with the ‘loop’ shown above providing a line guide for ropes as part of the rigging – this is known as a fairlead. The construction of the piece suggests that the fairlead could be adjusted to move to the left or right of its current position which would allow the ropes to be tensioned or repositioned. The section of wood standing proud in the centre of the item might be a stringer providing structural support for the gunwale and allowing the attachment of further framing. A screw noted on the top right of the image above appears to have an even thread suggesting that it was machine manufactured. This type of machinery didn’t become widespread until the late 18th century and so this find is likely to date to the late 18th or 19th century. Clay tobacco pipes like this one were in use from approximately 1600 onwards. They show a distinct typology in the construction of their bowls, which can allow relatively accurate dating. 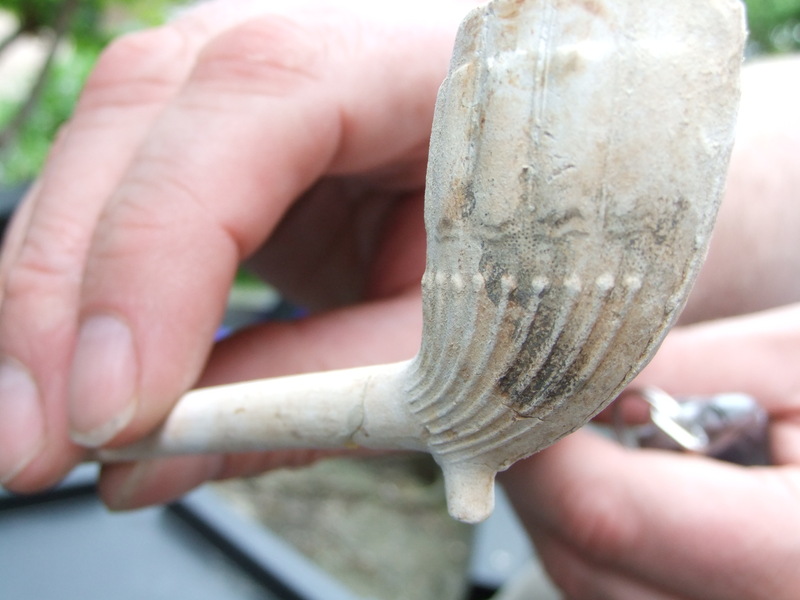 Images of this find were shown to Lorraine Mepham, finds specialist at Wessex Archaeology. This pipe is decorated with fluted patterns and has a spurred bowl. This example, Lorraine tells us, is likely to have been made in a mould. A faint seam, visible around the bowl of the pipe and extending down over the spur, suggests that this was manufactured in the 19th century. By this time, this type of pipe was being mass produced and manufacturing processes no longer allowed for the quality of finish seen on earlier examples, which would have seen the seam smoothed off. This find is retained in personal possession and is described as having been found off 4 miles off Eastbourne by a vessel using pots or creels. It was reported through FIPAD by the finders.